During the program, you can expect me to make a real bowling ball magically appear on stage, visually restore a torn newspaper, levitate an antique table, cause sporadic weather changes, and much more. I make it very clear that what I do is an optical illusion and only God can do real miracles. I utilize comedy, audience participation, and sleight of hand to establish credibility with the audience; so that I may then share with them my personal testimony and effectively present the gospel. 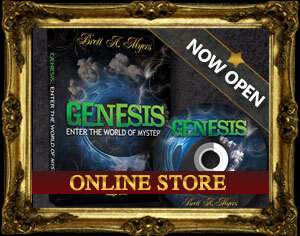 Brett A. Myers is an illusionist who has taken his talents around the world to share the gospel of Christ. Each year he performs over 140 shows that include army bases, theaters, colleges, conferences, corporations, and churches from coast to coast. Born in Chambersburg, PA, he began touring at an early age and launched his ministry in 2005. Since then, he married his beautiful bride Labrina, and together they are now touring the country with their talents. Using a variety of amazing effects, Brett tells how he overcame fear, anxiety, and depression and how he discovered the true source of peace and fulfillment. His desire is to create environments that inspire life-change and challenge a person’s perception of reality, in a world of illusion. I believe that the teachings and character of Jesus Christ, as revealed in the Holy Scriptures, are paramount to the way I live out every facet of my life. I also believe that I must be the very best at what I do, so the audience will want to listen to the message God has entrusted to me. When talking to hosts about my philosophy behind ministry, I often use the example of Michael Jordan that my teacher once told me. What does he know about clothing that I don’t? Absolutely, nothing…but he gets paid millions of dollars to do clothing commercials. Why? People believe that he is a credible person because he’s extremely gifted at what he does…basketball. In the same way, I build credibility with my audience through excellence in the talent that God has given me. Once a bridge of credibility is established, I can then effectively share my faith to an audience that is interested in what I have to say.